Last month, we spoke about the importance of effective communication and the very real business benefits it can bring. 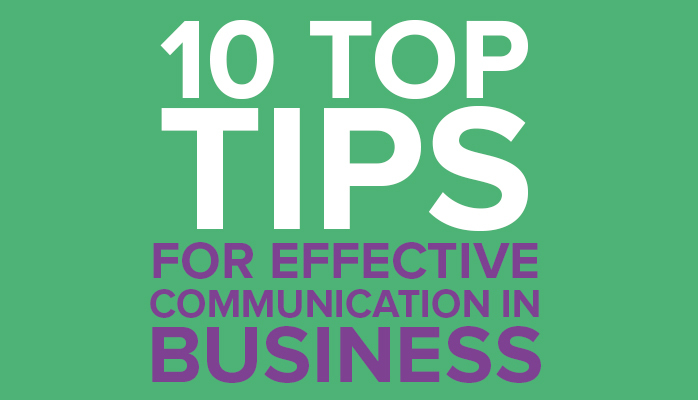 But how do you communicate effectively with your staff and colleagues to get to those results? “It’s not what you say but how you say it” is as important as ever. The most important thing to remember is that effective communication is a two-way street. Start by listening. This gives you clarity on characters, conflicts and context of a situation before you speak. It also stops you from making assumptions or jumping to conclusions, both of which can be damaging. Make eye contact whilst listening so the other person or people know you are paying attention. It’s important to not just listen to what is said. Pay attention too to how it is said and take notice of any non-verbal clues. If, for example, someone looks down or appears uncomfortable, they may be withholding information. You may need to ask more probing questions to really get to the bottom of the issue. Some people are more responsive to written communication, some verbal and some expressed (body language). If you need to get the same message to lots of people within the organisation, use a combination of techniques. Hold a face to face meeting first, then follow up with details in an email or letter, for example. In some cases, a one to one meeting or a demonstration will be the most effective course of action. Tailor your approach to the situation. Before you broach an issue, make sure you have all the facts. Have information to hand that will back up what you’re saying. Getting all the important information across the first time can be really important. If there are gaps it may cause ongoing problems and a lack of clarity. Even if you’re not 100% confident, you need to appear that way. It’s vital for gaining the trust and buy in of your audience. Body language goes a long way in appearing confident – stand up straight, make eye contact and, if appropriate, smile. Speak clearly and think about your tone of voice. Using humour can be an effective way to diffuse tension. But think carefully – make sure your “jokes” aren’t going to offend anyone. And don’t overdo it – you’re not a stand up comedian! You may only get one chance to say what you need to say, so make sure there are no misunderstandings. And make sure you’ve got to the point before people’s attention has wandered. Using simple language doesn’t mean talking down to staff and making them feel patronised. It means being articulate and avoiding jargon. It’s OK to use technical language if you know your audience understands what you’re saying. The right level of formality will depend on the audience and the context. You may use more formal language in written communication than in person. That’s fine, as long as it’s still clear, and as long as the overall message is consistent. Consider the native language of your audience. If it’s different to your own, bear that in mind. Perhaps slow your speech down a fraction. Using “I” rather than “you” usually sounds more assertive and less aggressive. “I need more information” will probably go down better than “you need to give me more information” – people are more likely to respond to a request than an order. In another context, if talking to a team, include yourself within their number by using “we” to build that connection. Don’t just talk at people. Give your audience, be it one individual or a room full of colleagues, the opportunity to ask questions. Even if you are sharing information via email, encourage feedback. If you don’t know the answer to a question, don’t just fudge it – people will know. Be honest, go away and find the answer, and then respond when fully informed. You’re more likely to get a positive result if you are positive. Be helpful, be encouraging, and focus on solutions, not the problem. Communication won’t be effective if one party is distracted. Sometimes it’s fine to pop along to someone’s desk for a quick word. Other times, it’s definitely more appropriate to arrange a set time and a quiet place with privacy. Think about the likely content and outcome of the communication and plan accordingly. Having a regular structure of weekly or monthly meetings can help and set expectations. The people involved will know to set that time aside and are less likely to resent the interruption. The digital age has presented new challenges when it comes to communicating effectively. Technology enables teams to work remotely and from different locations, which is great for offering flexible working opportunities. But it can be more difficult to connect with colleagues and create strong working relationships. It’s important not to rely on email alone as a means of communicating with these colleagues. They can miss out on non-verbal cuesand there’s a danger of misconstruing communication which can impact morale and hinder teamwork. Make an effort to get face to face when you need to discuss important issues. If being in the same room isn’t possible, get comfortable with using Skype or other video chat software so you can at least see each other’s facial expression. Thank your audience for their time. It will cost nothing, but simple courtesy is usually appreciated. It can be a good opportunity to invite follow up on a topic too. Hopefully you will consider some of the tips to support your continuous improvement journey.